Each time I offer a grade to one of my children, I try to customize it a little to fit their skill level, interests, and personality. This time around with 11th grade it is no different. My youngest son is just turning 15 years old so he is a very young 11th grader. This adds a level of challenge as far as maturity in handling certain topics and issues. He is also my most sensitive child and this makes me think a little more before handing him some books that his older brothers handled with different life experiences. We are still contemplating a “gap year” either next year or the year after he officially graduates from high school. With those background points in mind, here is what I have come up for his Junior year of high school. History: Ancient history using Tapestry of Grace Year 1 Redesign. We are supplementing with Teaching Company’s Ancient Civilizations Before Alexander the Great. He will be reading lots and lots of the Bible in a historical context using TOG. I had this plan put together for his older brother so I tweaked it just a little to be heavier on the biblical aspects since his main aim in learning ancient history is to connect secular and biblical events. I am hoping to learn some new things alongside him. Literature: Tapestry of Grace Year 1 Redesign Ancient literature almost identical to what his brother completed but with more responses in writing. He will be using Teaching Company videos to study the Iliad. He has several free reading books on his list this year in addition to his more formal literature assignments. (more on his free reading in a future post). Math: Saxon Algebra 2….finishing soon and then we don’t know what we are going to be doing. He may possibly take a math course at the community college, or perhaps a Teaching Textbook course. Chemistry: Same as his older brother, read more in this entry and this one too. Astronomy: Already shared most of the plan for astronomy in this blog entry. We have since added Google Sky Map app to our phone and it has revolutionized our star gazing. We have learned more in the last week about the stars and planets in our universe than we ever did before. Amazing program. Art and Music is a modified version of my Ancient Art ebook with an emphasis on the Artist Pursuits book this time around. He is also going to participate in Sketch Tuesday and continue his study of the violin. Robotics: Read more in this entry. Creative Writing: Read more in this entry. Videography: He has started using Corel VideoStudio to make short videos. There is a lot to learn and it was hard to come up with a plan. In the end, he fiddled with it over the summer and came up with his own list of questions to investigate as part of the course and now he is just starting to take video, put it on the computer, and manipulate it into something interesting. We came up with a simple video project assignment for him to start with. This is so far out of my realm of knowledge that he is really self-teaching this course with a little back up from his oldest, very techno savvy, older brother. I am not sure how or if this course will be going on his transcript but I am keeping track of his time and his work on Homeschool Tracker. I may mold some sort of Robotics/Videography/Computer Tech sort of course to roll all his work into for official records. It is definitely a work in progress. Baking with the Sonoma Kids Baking Cookbook. See this entry for more information. I am surprised at how well this is going with Mr. B. He is a natural in the kitchen and I love it! It looks fairly complicated but really it has worked well so far. This is a child that likes to mix things up so having a core in the morning and then different subjects to investigate in the afternoon works great for him. There you go….finally on paper and in one place. Hope it helps you in your planning for high school. 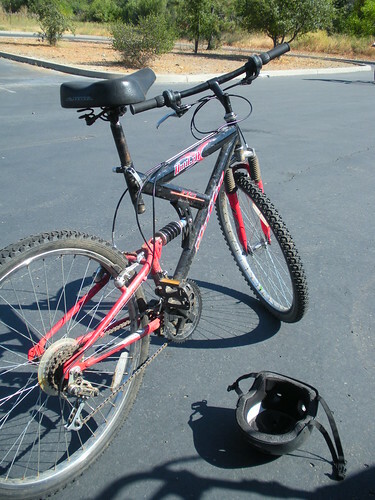 Bike riding is part of their week and is considered fun and not part of the curriculum. Both my high school age boys are a big part of the front yard remodeling. 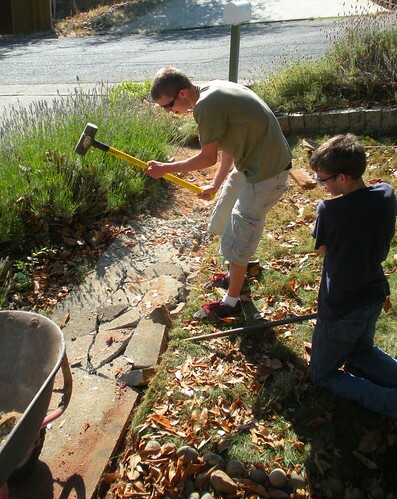 They had a great time using the sledge hammer and pry bar to remove the old ugly concrete sidewalk from our front yard. They are now helping to design and lay the new pavers as part of the remodel. I had looked at that Sky Map app, but was not sure it would very useful- I’ll have to order it! After reading your last post about your ds cooking, I relaxed a bit with my 9yo cook and have been letting him work in the kitchen more. (He loves to cook, but I am not the most patient person in the kitchen.) Categorizing it as school made me rethink the process. As it turns out, we have had a lot of fun. I also wanted to let you know that my high school dd has used Teaching Textbooks and likes them. Thanks, as always, for the inspiration. You always have such thought provoking posts. I am intrigued by the idea of doing a gap year during rather than after high school. My middle son is very smart and has been doing the same work as his older brother since he was four. But I think graduating him with his brother would not serve him well emotionally. A couple things you might want to check out are the Teaching Company set Rome and the Barbarians, which covers a huge swath of Roman history and the cultures the encountered as they expanded. The other is the Kitchen Chemistry openware course from MIT. It might be a fun follow on to the baking work you’re doing. On the video course, maybe you could merge it with some of your poetry memorization and some public speaking and make it a communications course. We have LOVED having Mr. B baking these past few weeks and I see a new confidence in him as he uses the cookbook to learn new skills and to be all on his own. I love this age where they are ready to try new things and make them their own. The Google Sky Map was free so you definitely want to check it out! Thanks for the tip about the TC course on the Romans. I will check it out and see if it fits our time period. Sounds wonderful!! I’m really interested in that phone ap–might have to finally trade in my pre-paid trac phone!! It is definitely something to think about, not only for this app but all the other apps out there that would enhance homeschooling and learning.